So here it is. Introducing somebody who I look up to, Justin Angsuwat. Justin’s rise through the ranks of Telstra, one of Australia’s largest telecommunication companies, is not just impressive because of the heights that he has reached but also because of the time in which he did it. He went from a HR Graduate in 2005 to an Executive HR Advisor (Chief of Staff) in 2007, a role he occupied up until 2010. I recently interviewed him to learn more about his transition from Sydney to New York and how he landed his role as Senior Associate with Pricewaterhouse Coopers. Damon: When did you first fall in love with the idea of moving to New York? Justin: I actually fell in love with the idea of moving to New York City, before falling in love with NYC itself. 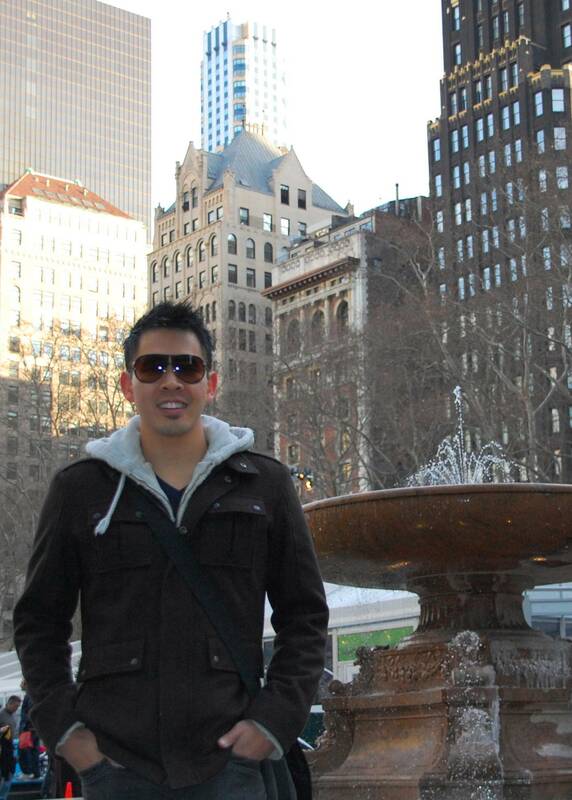 In fact, the first time I visited NYC was about a year before I moved here, while on my way to move to Sweden. I think moving to NYC was more about fulfilling a personal dream for me than a planned career move. Damon: What were your initial steps in order to making that dream happen? Justin: The first thing I did was have a conversation with my manager, explaining my dream of moving to NYC. She was supportive of the move as she understood me – my dreams, aspirations and personality. Having this support turned out to be incredibly important to bringing my dream to life, and I would encourage anyone in the same situation to not only have their manager’s approval to pursue this dream, but also take them on the journey – turn them from a stakeholder to your advocate. Damon: How crucial was networks to facilitating your dream move? Justin: Networks were crucial in bringing my dream to life. I can’t emphasise this enough. As I mentioned earlier, my manager was incredibly important in making this happen. Being the Head of HR at Telstra, my manager had connections all over the world, including Chief HR Officers (CHROs) of large Fortune 500 companies based in NYC. I was lucky to not only have her support to move to NYC, but she made it her personal mission to get me a job here. She was one of my biggest advocates within the company, to other CHROs, and even helped enlist support. As a result, few executives within the company dug deep into their networks and introduced – and advocated – me to their contacts in NYC, handing me a great NYC network. I can categorically say that I would not have met the people I met, been offered the roles I was offered and had the opportunities that I had, without these networks. Given how difficult it was to break into the US market during the recession combined with the reluctance of companies sponsor visas, without a strong network I could not have brought my dream to life. Damon: What was the interview process like? Companies want to know about impact. What have you done, or what can you do to deliver some sort of impact. Gone are the days of talking in generalities and blue-sky visions without some sort of impact. Australia is a smaller market than the US. Be prepared to describe your experience in that context – e.g., how big is your current employer, what industry is it in, how much revenue does it generate etc. The US job market is somewhat rebounding (although the jobless rate is still high), and CEOs are confident about revenue growth, but still concerned about talent shortages. This doesn’t mean it’s a candidate market though. Be prepared to discuss the skills you bring to the company and put yourself in your potential employer’s shoes – what are the compelling reasons to hire you over the other 30 resumes sitting on their desk. Understand your working visa options and be prepared to explain this in two sentences or less. An Australian E-3 visa is rarely heard of in the US, and places a far smaller burden on employers than the H1-B visa that they are more familiar with. Don’t let an interviewer just go on assumptions. I have learned several other tips about looking for a job in the US and would like to get it touch, I’d be more than happy to discuss them. Damon: What was transition and onboarding period like? Justin: To be honest it was a bit hectic, but that’s the nature of these things. The E-3 visa allows you to enter the country 10 days before commencing your job, and let me tell you, it’s a hectic 10 days – sorting out an apartment, leases, social security, bank accounts, credit cards, furniture etc! The onboarding period was great though. I met great people that I’m still friends with and it gave me a good preview to working life in the US. Five months in, and I’m still learning! Damon: What were the biggest differences you noticed between America and Australia? Justin: The biggest difference would have to be the size and opportunity here. Working for Telstra in Australia was a great experience; however, there are relatively few companies of a similar size, and even fewer by industry segment. Compare that to the nearly 10% of the Fortune 500 which are headquartered here in New York alone! Combine that with the pace at which these companies operate and it’s a really interesting environment to work in. As a consultant, you get involved with these titans of industry with their multi-billion dollar investments and workforces numbering in the hundreds of thousands, as well as nimble boutique companies whose speed and determination are relentless. To me, that’s what makes this such a great place to work. Damon: How did you find trying to acclimatize to not only a new country but also a new company and position? Justin: Acclimatizing was an interesting, but not new experience to me, having been lucky enough to spend time acclimatizing to Sweden’s culture while living there and travelling throughout Europe. That being said, it did still take me a good two or three months to better understand the NYC culture and lifestyle. Having two roommates from NYC helped as well – although one girl is originally from Florida and the other from Washington – I think very few people are actually born and bred NYC! I love the city, the nightlife, the lifestyle and everything that comes with being a New Yorker. The change from industry to consulting, on the other hand, was a massive shift for me. I had to forget everything I thought I knew about management and HR because this was a whole new game. Luckily, I found that industry experience helped to bring insight and a unique perspective to my projects in the Firm. Plus, I really enjoy the culture here. Damon: What other tips do you have for people looking to make the move overseas? Justin: The biggest tip I have is be persistent. I’m not a very persistent person by nature – I hate constantly chasing after people – but I had mentors and supporters who were and continued to push me to follow up. My manager, our Head of HR, was relentless in her pursuit for my job. She had a copy of my resume on hand at all times, and in meetings with other CHROs or senior consultants, she would present my resume and advocate as to why they should hire me. This was a highly effective approach, and another reason why I mention that it’s important to not only have your manager as an informed stakeholder, but as an active advocate. Once you start, you will find momentum start to build. Capitalise on the momentum and make things happen. I was lucky to have a strong network of mentors and supporters to help me bring my dream to life, and am extremely thankful to have them. I wish you the best of luck on pursuing your dreams – never let them die. I hope you enjoyed the interview and that it inspired you to dream big and provided you with some hints and tips to help you make your move should you so desire. If you have any follow-up questions drop them below in the comments box and Justin will get back to you. Like I promised earlier here is the musical link to this post, I think you’ll find it quite fitting. I present to you, Empire State of Mind. I moved to Australia from Canada in 2005, when I was 18 years old and I made the move over by myself as well. I can appreciate the challenges involved and how tough it can be to start a new life for yourself. I only wish I had the network and support which you seemed to have made excellent use of when I moved over. It sounds like you have made a tremendous impact in Australia and I hope that you can continue this trend in the States. It’s awesome to hear about people in HR doing so well at a young age, and it gives me hope that I’ll be able to make a big impact some day soon. I’ve had the good fortune to move overseas in my mid-twenties – can’t imagine what it would be like if I was 18 – I’m impressed by your move from Canada and your success to date in Australia. Both you and Damon are flying the banner for us – congrats to you both! Awesome interview and inspiring words of advice from Justin! Thanks Nicholas – appreciate your kind words!